Hampi Tourism; the place connotes images of colossal and intriguing ruins spread over vast acres of land, evidence of the bygone era of grandeur, pomp, and splendor. A place with fascinating stories to tell; Hampi beckons every tourist to visit and drown in the mysterious beauty of its rugged landscape, monolithic structures, intricately carved monuments and the fascinating and weird arrangement of its huge boulders. WHY YOU MUST MAKE HAMPI TRAVEL PLAN? Hampi which was once the base of the powerful Vijayanagara Empire has been declared as a UNESCO World Heritage Site since 1986. 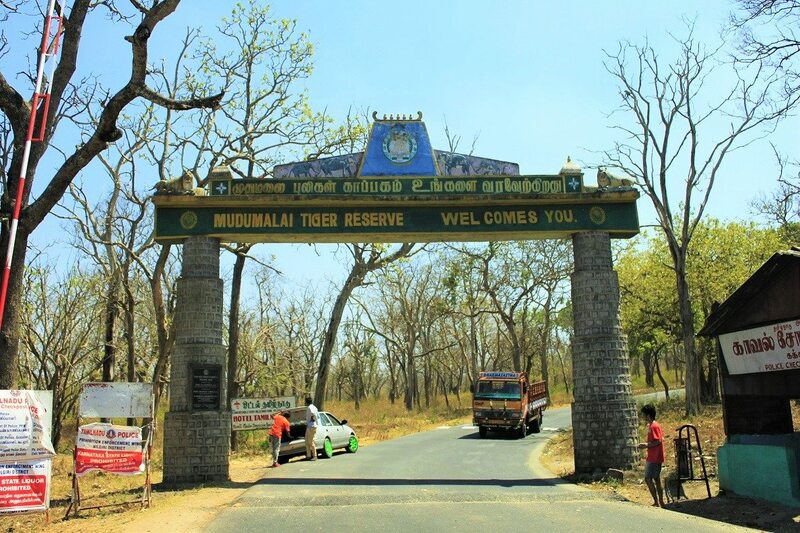 It is one of the must-visit sites in Karnataka and draws hordes of tourists always of the year. And why not! Hampi tourism is all-encompassing; history, natural beauty, mythology, sightseeing, cultural fulfillment and one of the best examples of the tech-savvy minds of the rulers of those days. Located on the banks of the tempestuous Tungabhadra, in central Karnataka, Hampi can be termed as a dream-world for every photographer, history enthusiast and all those seeking a place to de-stress. With a host of places to visit in Hampi and the surrounding region, there will be no dull moment in the entire span of your visit. Hampi used to be a bouldering ruin town of north Karnataka only for those in the know but not anymore. Hampi has in recent time exploded in popularity amongst backpackers community, and many foreigners travel to India individually to check out Hampi. Make sure to take an experienced local guide with you if you are new to Hampi since rocks can be pretty tricky. 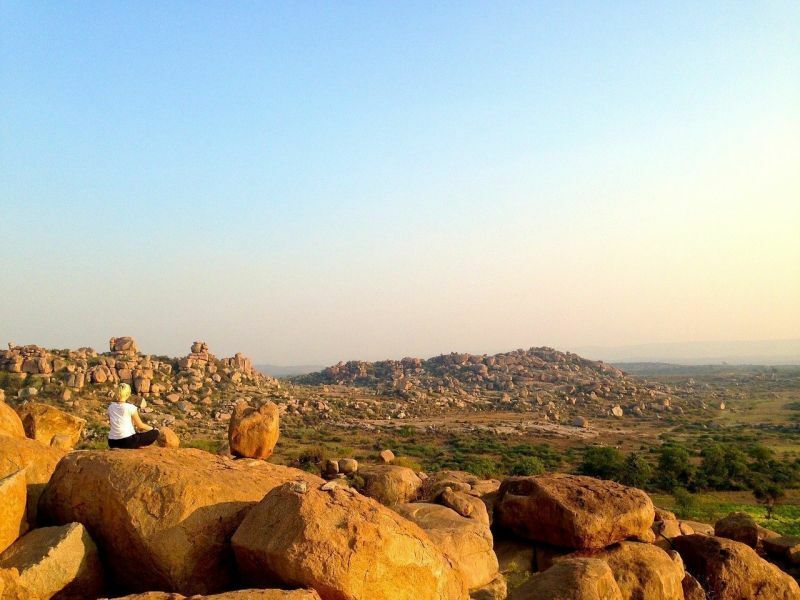 November, December & January is the best time of the year for bouldering in Hampi. It’s better to avoid the hot and dry season from March to June. Make sure you have the right gear & keep plenty of water before you venture out. You can usually rent mats & moped (trim down version of bikes) from your guesthouse and go exploring the amazing piles of rocks littering the town. Hampi serves as a rejuvenating weekend getaway to residents of Bangalore provided you set out very early in the morning. And believe me, the trip always turns out to be a fulfilling and rewarding experience. You move out with a bagful of memories of the sheer magnificence of the place; inspiring, tragic, centuries-old remains of the erstwhile Vijayanagar Empire! 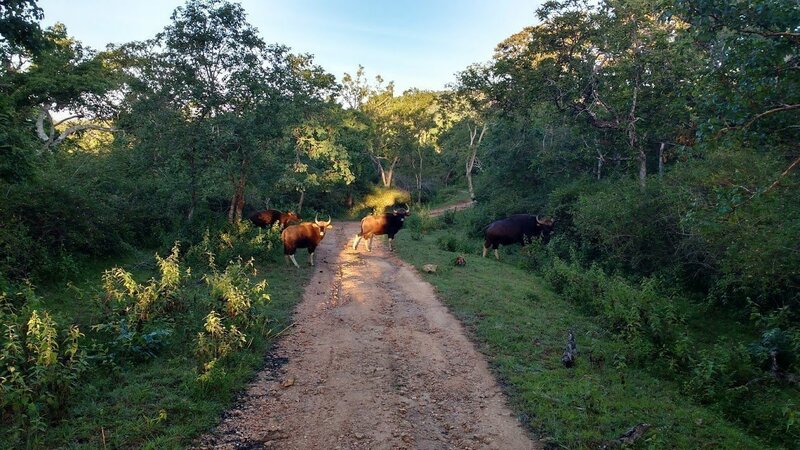 There are several ways you can get to Hampi and the common point in all is Hospet, a bustling town offering a lot of travel connections. Many road and rail routes pass through this town from several major cities in and around the area. By Rail: For rail commuters, the nearest rail station is Hospet Junction which is at 13 km from Hampi. Several overnight trains ply from Bangalore, Goa, Hyderabad, Mysore and so on to this place. Local buses ply from the railway station to the bus depot and further ahead to Hampi. In this context, you need to be alert for rickshaw drivers who will charge you exorbitantly for a very dusty and tiring ride. By Road: There are a couple of options here. Buses of Karnataka State Road Transport Corporation operate daily from Hospet to Mysore, Bangalore, Gokarna etc. From Hospet, again the local buses take you to your destination. 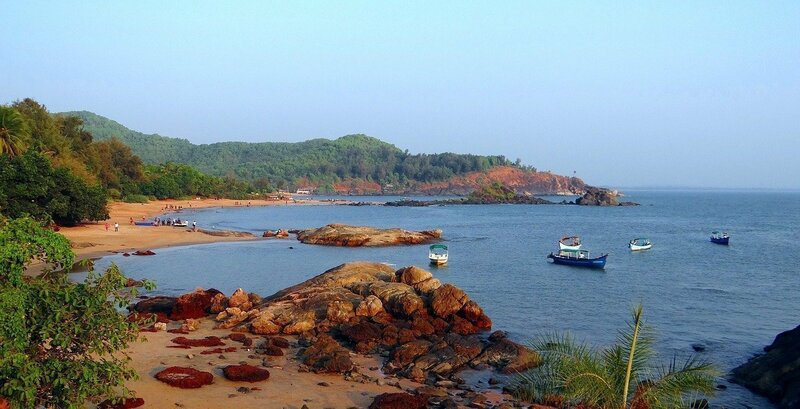 Private operators also offer a direct overnight service to Hampi from places in Goa or Gokarna. However, there is no return service provided by them. The third option is to drive your own vehicle or reach via a tourist vehicle from a city like Bangalore, Mysore, Hubli etc. Hampi to Bangalore covers about 353 kms and takes about seven to eight hours depending upon your speed. The route is quite enjoyable as it passes through some beautiful farmlands, vineyards and in general, lovely countryside. By Flight: The nearest major airport is Hubli which is at a distance of 143 km from Hampi. Then again you must take the roadway to reach Hampi. You can also resort to the Jindal Vijaynagar Airport near Bellary which is situated about 40 km from Hampi. The airport is connected to major cities like Hyderabad or Bengaluru through twin-engine, turboprop airlines meant for short haul distances. The ideal time to visit Hampi is the period from November to March as these are the periods of best weather and times when you can immerse in the spirit of the colorful cultural and musical activities that take place here. The Hampi festival, for one, is a three-day festival normally held around November and is the time when the entire ruins come alive with dance, music, drama, puppet shows and varied kinds of fireworks. A classical music festival is held around the months of January or February to commemorate the birth of poet Purandaradasa. Another event that can be of great interest to you is the Virupaksha Car Festival that is held in March or April. It is one of the largest of all and symbolizes the yearly marriage ceremony of the goddesses and gods. There are several options of Hampi accommodation ranging from star rated resorts to budget hotels in Hampi. The luxurious setting can be obtained in Hospet which boasts of premium hotels like Royal Orchid Central Kireeti or the opulent Orange County Hampi Resort located in Kamalapura. Some of the other Hampi resorts stay includes the Kishkinda Heritage Resort Hampi, Hampi’s Boulders and Clark’s Inn etc. On the other hand, places to stay in Hampi which include clean, decent guesthouses or budget hotels are localized either near the main bazaar and the bus stand or Virupapur Gadde which lies on the river’s other side. This is often referred to as Hippie Island and draws a lot of backpackers who choose this area for their Hampi to stay. Besides visiting the travel hotspots in Hampi, there are a couple of other interesting things to do. Given below is a list of them. Chilling on the Backpacker’s Island is one of the favorite activities for most of the backpack travelers. The island stands in the center of the river and is one of the star attractions in the Hampi tourism Many guest houses, coffee places, and restaurants flourish here, and you can have your fill of them along with a relaxing stint in a hammock. Getting involved in the bathing ritual of the elephant residing in the Virupaksha Temple is another activity. It is an hour long ritual where the elephant is bathed in the river. Tourists are welcome to give a helping hand in return for gifts like bananas. Bird lovers can have a field day watching some rare bird species, flamingos and pelicans at the Ankhasamudra bird sanctuary. You can also go for a boat ride on the river waters. 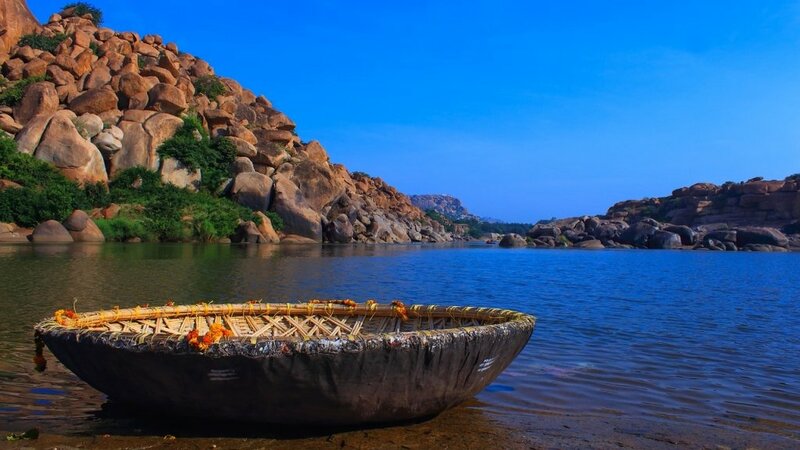 Coracles are the name of the bowl-shaped boats that take you on a leisure ride through Tungabhadra waters reaching out to some of the unseen temples with beautiful carvings. However, the ride charge is pretty steep; almost costs about a thousand rupees for an hour or less. Visiting a local village, the likes of Anegundi; mingling with the locals, eating their food, getting to know their lifestyle and overall obtaining an enriching experience. Cycling is another activity which is very much alive here. People, especially foreigners, take bicycles on rent and roam around with a map on their own. You need to plan your sightseeing in Hampi well if you want to have your fill of everything or I would rather say almost everything as a single visit will fail to leave you satiated. The sightseeing areas can be divided into two parts; the Royal Centre and the Sacred Centre which lie within a 3 km distance from one another. The Sacred Centre includes temples and other religious sites while all structures related to the former royalty lie in the Royal Centre. As such you need to set aside a minimum of three days if you want to cover almost all the travel spots. There are several options to carry on your sightseeing. If you are a practiced walker then you can cover the area on foot. Go equipped with water, don a hat, apply some sunscreen and explore to your heart’s content. You can also hire a bicycle or a moped for the day. You will need to offer something as a security to the owner. The third option is to hire an auto rickshaw for the entire day or on a personal basis. Tours are also organized by bus operators as a feature of their larger package. However, in all cases do not forget to hire a guide as he alone will be able to recreate the magic of the past. Authorized guides are available who will take you around and explain the importance and history of the places. They will add some spice to the story sometimes, but it is still nice to listen to their explanation which brings the grandeur and royalty of the place alive. 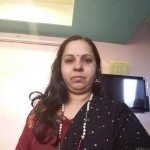 They will charge around INR 1500-2000 and remember you can negotiate with them and find a mutually beneficial plan. As mentioned above, the Sacred Centre of Hampi includes several temples that are all must visit sites. Before embarking on your temple journey, however, remember that the temples remain closed for visitors between 12.30 pm and 2 pm. This will help you to plan your sightseeing accordingly. Most of the Hampi temples provide for free entry though some may charge a nominal fee for phones or cameras. Following is a brief on a few of them. Virupaksha Temple: This is the only religious site where rituals are still carried on today. One of the largest and oldest structures this edifice stands tall at a height of nine stories with its impressive golden tower capping the top. Lord Shiva is the main deity of this temple. The Stone Chariot: A huge chariot in stone with intricate carvings adds to the beauty of the Vithala temple. One of the three chariots found in India, this one leaves you awestruck at the depth of the artisans’ skill. Monolith Bull: The imposing monolith Bull can be reached by climbing a few stairs as the Hampi Bazaar ends. The bull is a huge piece carved out of a single rock and has a shrine enclosing it. Achyutraya Temple: As you climb further up the stairs after the Monolith Bull you reach the Achyutraya temple. Unfortunately, this temple is not in a good shape with no maintenance work in progress. Badaviling Temple: This temple dedicated to Lord Shiva includes a huge Shiva Linga carved out of a single stone. It sits in a pool of water and there is a priest sprinkling holy water from the Shiva Linga on to the visitors. Statue of Lakshmi Narasimha: Beside the Shiva Linga stands the statue of Narasimha, half man, and half lion. It also dwarfs you with its sheer magnificence and size. Sasivekalu Ganesh: A huge statue of Ganesh in stone lies beside the Hemakuta Hill temple’s entrance. This is enclosed by a shrine. Hemakuta Hill temple: The Hemakuta Hill temples lie on a small hill which gives an enchanting view of Hampi. Many tourists climb uphill to get an epic view of the setting sun. Malyavanta Raghunath Temple: This temple lies on Malyavanta Hill and has priests chanting hymns and prayers there. A huge boulder that is located within the temple structure is a big tourist attraction in addition to the beautiful sunset that can be viewed from atop. The entrance is easily accessible by autos and cars. Monkey Temple: A temple dedicated to the Monkey God, Hanuman, the temple can be accessed by climbing almost 600 stairs. Matanga Hill: The Matanga hilltop offers a panoramic view of the town and some stunning views of the sunrise or sunset. You can start off early before the heat catches up with you and go equipped with a bottle of water and a protective cap. Lotus Mahal: Shaped in the form of a lotus this was a separate enclosure meant for the royal ladies of the Vijayanagara dynasty. Located within the Zenana Enclosure, it is one of the few buildings that have remained intact to date. Elephant Stable: A huge row of domed chambers which housed the elephants of royalty at one point of time, is also in quite a good shape today. A favorite haunt for the shutter-happy tourist, this place is a not to be missed site. Royal Enclosure: Spread across vast acres of land, this was the base of the Vijayanagara Empire. Imposing structures of the ruins still draw throngs of tourists to the site. Hampi is a place you bid goodbye to with your mind totally amazed at the awesome collection of monuments spread across the entire area. Every boulder there is entrenched with a meaning. Some have helped to create majestic hills of boulders, some have taken the form of ruins belonging way back to the Middle Age, some have gone towards the building of temples and others utilized for carvings. Hampi stands truly unique and magnificent among the heritage sites of India! Dear readers, I hope the blog post answered some of the questions about Hampi tourism guide. Do you still have a question? Feel free to comment or rate us by clicking the 5 stars.